Major League Baseball teams have all officially had their Home Openers, but of all the players and teams that fans were excited to see take the field again, the appearance of the Dessert Cart was the most awaited of all. The dessert cart made its first major league appearance in the early 1980s back at Old Comiskey Park with the Chicago White Sox. 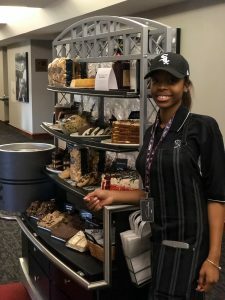 What started as a small cart of confections quickly became Comiskey’s secret weapon — the DH (Dessert Hero) for White Sox and visiting teams’ fans alike. So how did this valuable team player come to be? 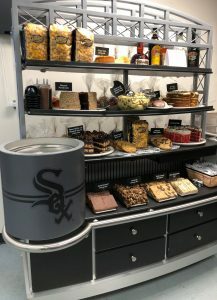 At Comiskey Park, Levy’s very first sports and entertainment location, premium dining had a small selection of desserts that suite attendants would hand deliver to each suite. 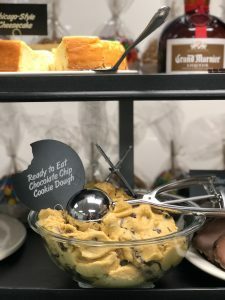 A few Levy team members got together and thought, “what if we could make this process better for guests by bringing a mobile cart of desserts around to all of the suites, giving our guests more options?” And thus, the first dessert cart was born. Originally stocked with only four items – Eadie Levy’s famous carrot cake, Chicago-style cheesecake, taffy apples, and turtles – the dessert cart has since expanded, both in physical cart size and dessert options. Today, the dessert cart wheels from suite to suite loaded with four to five cakes, multiple flavors of brownies and blondie bars, edible cookie dough, Garrett’s Popcorn, ice cream sundaes, candy apples, bags of candy, and more. And even with all of the fantastic choices, Eadie’s carrot cake remains a best seller. 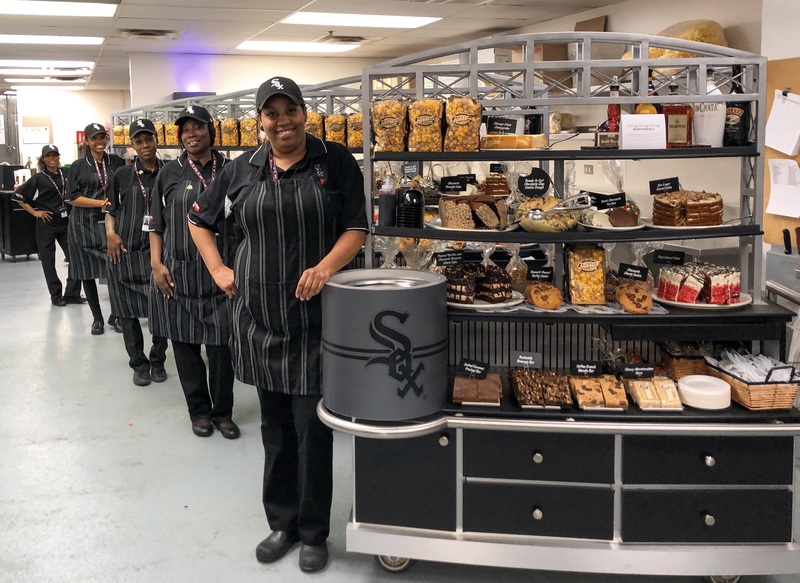 With so many fans eagerly awaiting its appearance each game at venues like Guaranteed Rate Field and Wrigley Field, how does the dessert cart prepare for its season opener? The prep actually starts during pre-season, when menus are tweaked and desserts are refined. 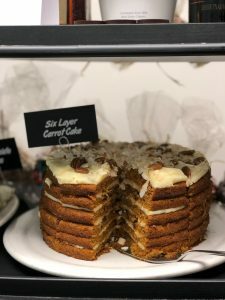 There are the staples, like Eadie’s carrot cake, that always stay on the menu, but depending on the location, some desserts will come and go each season. 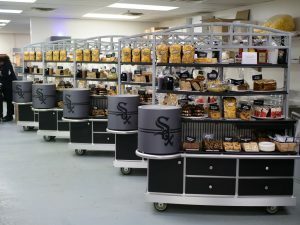 At its original home with the White Sox, there are actually five dessert carts, a fleet if you will, that roll up and down the club level of Guaranteed Rate Field. Before they roll out the door at the bottom of the first inning, the carts are all inspected one by one to make sure they’re perfect. Cakes are re-positioned to face just the right way, candy apples are lined up, and popcorn bags are all straightened to face out so guests have easy, quick views of their many dessert options. Before rolling out of the kitchen, the five dessert carts wait in a staggered line, primed to perfection and ready to roll through those kitchen doors. Once they’re given the green light, three dessert carts head to one end of the concourse and three to the other, slowly working their way back toward the middle suite by suite. Though the dessert cart is not a rookie anymore, the surprise and delight that guests have when it arrives at their suite door never fades. And no matter how your team performs, you can always count on the dessert cart to make it an amazing game day.